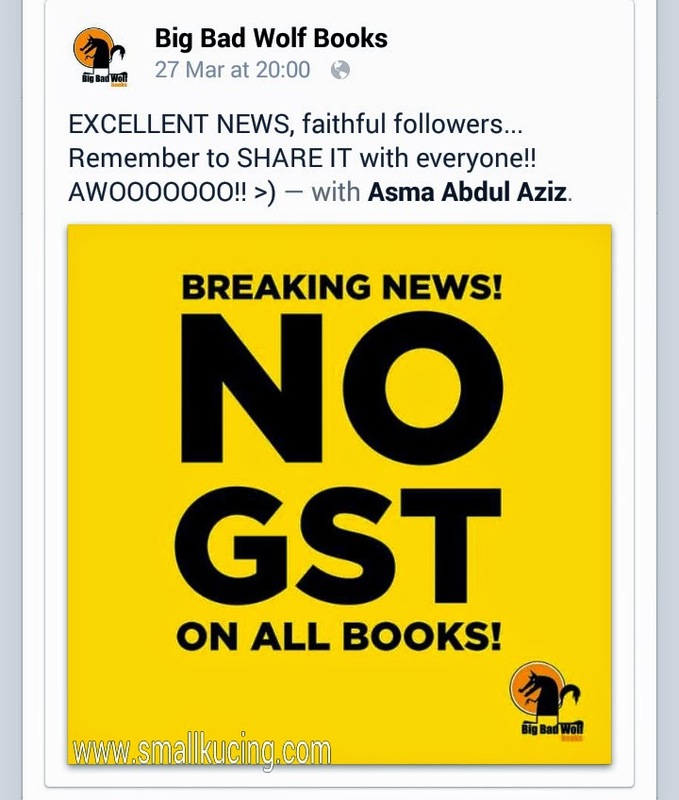 SMALL KUCING: No GST on All Books says Big Bad Wolf Books !! Howl!!!! Just saw the FANTASTIC NEWS in Big Bad Wolf Books Facebook. Here is a screen capture of the announcement. For more information, do headover to their Facebook page. Yahoo! That is a good news amidst all this GST Issue! That's very good news to all bookworms! Aaoooooooo!!!! I going to go again next year.. Gooodd!! Thats how it should be. Wow, good la, must grab as many as you can! This is great...I am patiently waiting for Ipoh's turn..missed it the first time. Ya ya I saw this in FB too, great news!! Woohoo! Good NEWS!! Especially to Mamarazzi.. happy for you too! wah .... happy la you! Today is last day and GO SHOPPING TODAY! GST! GST! Hip Hip Hooray!